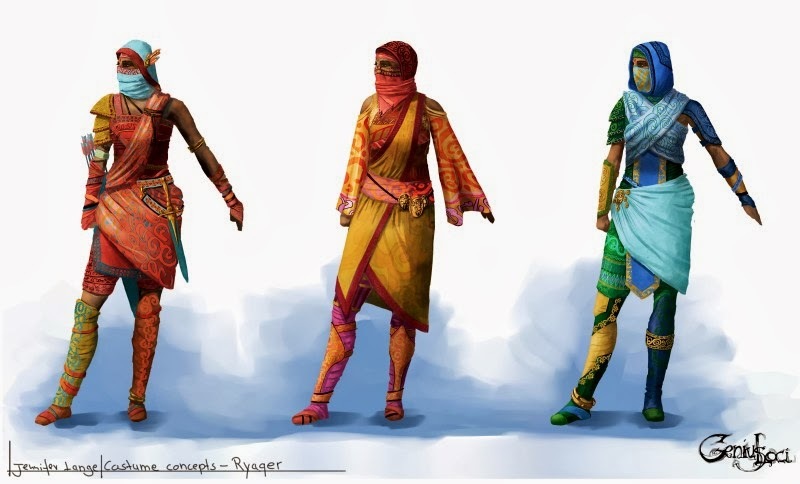 "The dancers were hennaj who almost floated, and amo, who were coloured in such a way that, when they stood together, they could form different Wild Signs. And the main character was played by an almost black suu who overtowered them all, it was quite a sight." I decided late in development to create subtypes for races other than humans. At first I thought it would be too much, but then I found it too human-centristic to make small differences into subtypes for them, but not others. So, there are now more appearances for the major races. Don't forget that there are many changes in the colours of the colourful peoples dwarves, naj, and garren, while humans always have dark hair and brown eyes in various shades, and beja are always black haired with blue or black eyes. 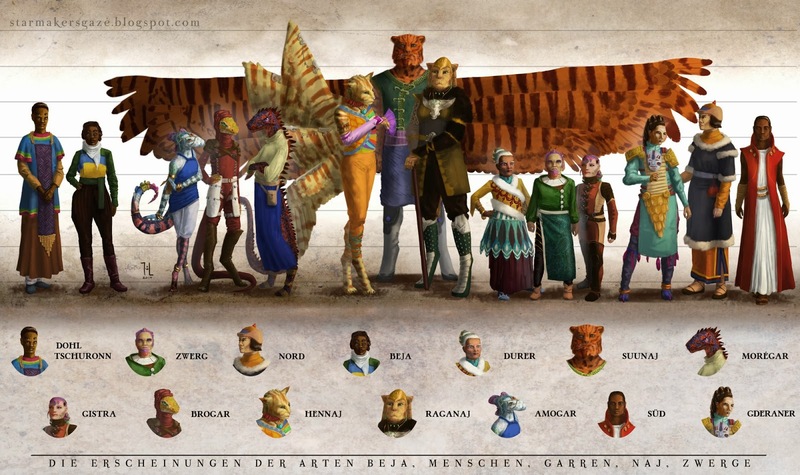 In a way, it was almost more fun to develop the subtypes later than alongside the races, because I had all the hard work done of creating them and fitting them into the world. Naturally, since neither shankeh nor elves have any different subtypes, they do not appear here. I also worked out halfbloods. I think it will be arbitrary to some extent which of their parents' features they inherit, and there really are only three kinds of halfbloods since only dwarves, humans, and beja mix - elves' children are all elves themselves and don't cause me any work, and raganaj, shankeh, and garren don't interbreed. The vast ocean at Gdera's west coast is regarded as the continent of water, the fourth "landmass". The myriad of islands are home to most peculiar tribes and cultures, and the less reachable shores harbour many secrets. Among the largest islands are Gat-Gat, the main island of the Gat archipelago; cold, northern Tuulmenhan; and Asfilass, off Gdera's coast. The flying raganaj have an advantage here, and many seafolk live with the tribes. Beja, who much enjoy water, are happy here as well. There are, however, no more fleeters here than elsewhere; it seems that they prefer sweetwater. "To the fifth grade, my line of masters has tried to map the Ryaq, and I have followed. We never managed it, and my apprentice chose a less hopeless task - mapping ley lines." Because some of the tiny islands are so remote - some barely more than a rock that happens to support a little vegetation and some tents - cultures are more separate in the Ryaq than elsewhere. Some peoples openly welcome strangers who bring news and wares, others attack without warning. Few maps exist of the Ryaq. 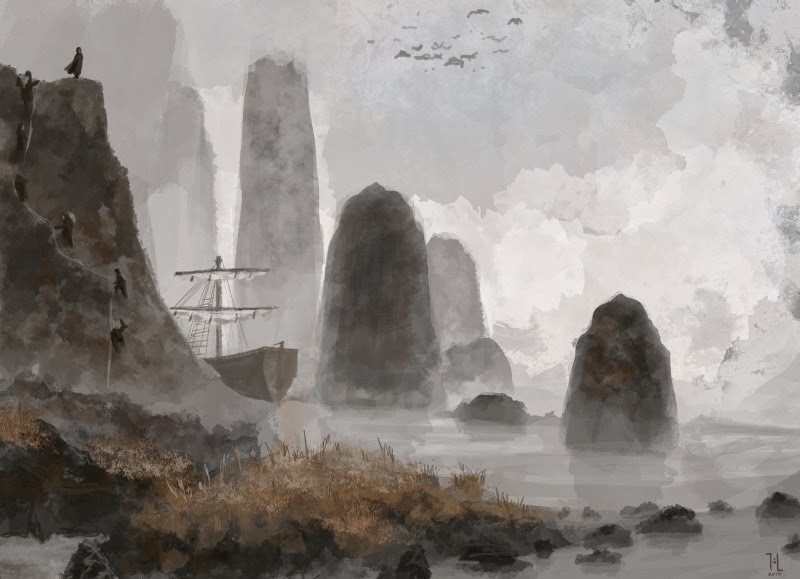 Notable places include the Summerstar Islands that rose after a meteor hit, the Fleeterstep Islands towards the Gat archipelago, and the Burning Islands and Firehome off Sawa's coast, where allegedly many plasmats live. "Sanskanar's eternal storm makes it damn near impossible to sail there. If you make it, though, and out again, you'll live like a prince." I only made the map to the Ryaq recently. There are more islands than I first expected, some very remote, but there's not quite so much space as in the Pacific. Still, islands are always hard to get to, so there will be space for stories about lost treasure, hidden kingdoms and whatnot. And pirates, too. Harr!